My name is Jose Gallo and this is my story of how I got Coldplay to Light Up The World with my Guitar Full of Dreams. Summary for Press – In 2014, I started Gallo Guitars, a guitar studio of interactive guitars that light up as you play, and 2017 has been a great year for us. This is the story of the 'before', the 'during' and the 'after'. In this text you will find how I decided to build a guitar for Jonny Buckland, Coldplay’s lead guitarist, how I gave it to him against all odds and how it’s been played all around the continent. Lighting Up The World, inspiring many and moving hundreds of thousands of people. My goal as an artist is to inspire creativity on every person and this is my story. It's been almost four years since I started Gallo Guitars, a guitar studio of interactive guitars that light up as you play, and 2017 has been a very special year for us. Through all this year AMAZING things have happened, including our great relationship with Beyonce’s Sugamamas’ lead guitarist Bibi McGill and, the out-of-this-world performances Coldplay has put on with our Guitar Full of Dreams. This guitar has now been played and shone in front of hundreds of thousands of people and it all started in Boston a little over two months ago. Very briefly, this is how it all happened. I’ve been an admirer of Coldplay's work for years, but in the beginning of this year, I started getting very inspired by their performances during their A Head Full Of Dreams World Tour. The amount of people they’ve been touching around the globe is just awe inspiring, and I wanted to be a part of it some way or another. All and all, it was the resonance of their work with my Light Up The World Project, that really urged me to build a guitar for them. I started the guitar around March and worked on it for several months as a side art project, while running Gallo Guitars. It took some time, but I completed it a couple of weeks before Coldplay made their stop in Boston. Then, I was able to use that time to document it, produce some demo videos and start a social media campaign. The whole idea was to Light Up The World during my song request – they take a request from Instagram for every show – as they played It Hurts Like Heaven on the guitar I made for them. The days leading up to the show were an emotional rollercoaster. There were very high highs, like when I saw all the support I was getting, but the lows were also deep, when I felt exhausted and like it wasn’t enough. All and all, it was the support from all my friends, family, followers, coldplayers and new friends that made me carry on till the end. On the night before the show, there were still no leads to get the guitar to Coldplay, so I sent some more emails and went to bed knowing that my best chance was to show up at the stadium the next day and look for a roadie. As I woke up early the following morning, I checked my email and finally saw a reply from someone in the Coldplay team. Their message was very nice and they said that they will forward the info, but it didn’t look too promising. 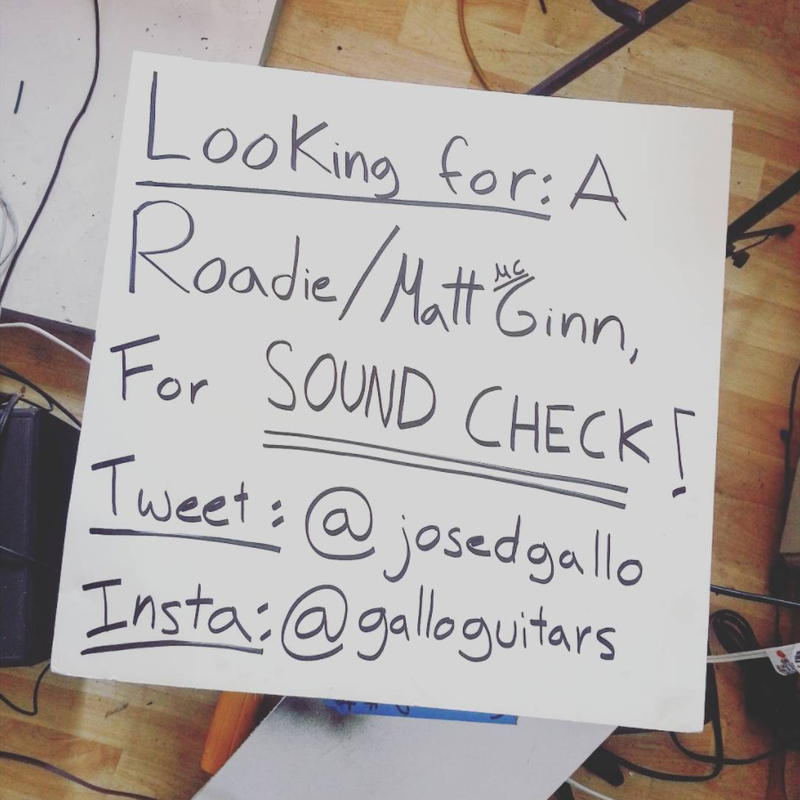 I got ready, made a sign, tuned the guitar and went to pick up my brother. We were now on our way to, what we didn’t know, was going to be a day full of joy. When we got to the stadium I took the guitar up on one shoulder and had a sign on my other hand. We walked to the front entrance and started asking around. Over there, we talked to several people from security and everybody was very kind to point us in the right direction. Then, we finally got to a place where we could actually get some roadies to come see us, but we were very quickly turned down as we couldn’t call anybody in the crew. However, before we turned around, I decided to send another email to the ONE person who had answered and tell her that we were at the stadium. As we walked back, we regathered and thought about our next move. We went to get some food, but as soon as we got in line, I checked my phone and THERE IT WAS. The lady from Coldplay in the UK had answered and told us that she had arranged a pickup, so we quickly turned around and went to meet someone from the crew in the ground level. Then we waited. After some time, we finally met two ladies who came to get the guitar. 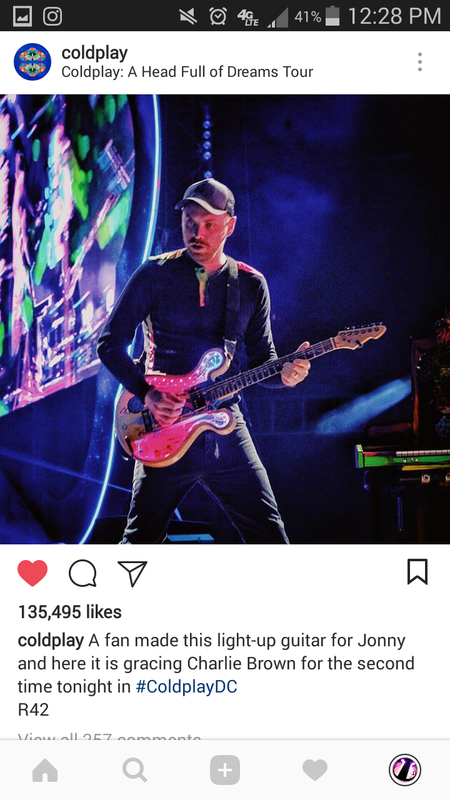 We talked to them for a little bit and then they took the guitar with them, letting us know that the guitar would be given to Jonny Buckland. That was the last time we saw the guitar that day. It took us a while to process what had just happened, but it was REAL. The aftermath to that story has just been out of this world. Coldplay did not play the guitar during my song request, but instead did something better: They adapted it to Charlie Brown, one of their fan’s favorites, and used it that same night! Now, great news keep coming, as they have continued to Light Up The World in several major cities like DC, Miami and Chicago.